- because I'm in love with the brushstrokes I lost sight of the main purpose: study colour relationships. - the "white" of the canvas is warmer. 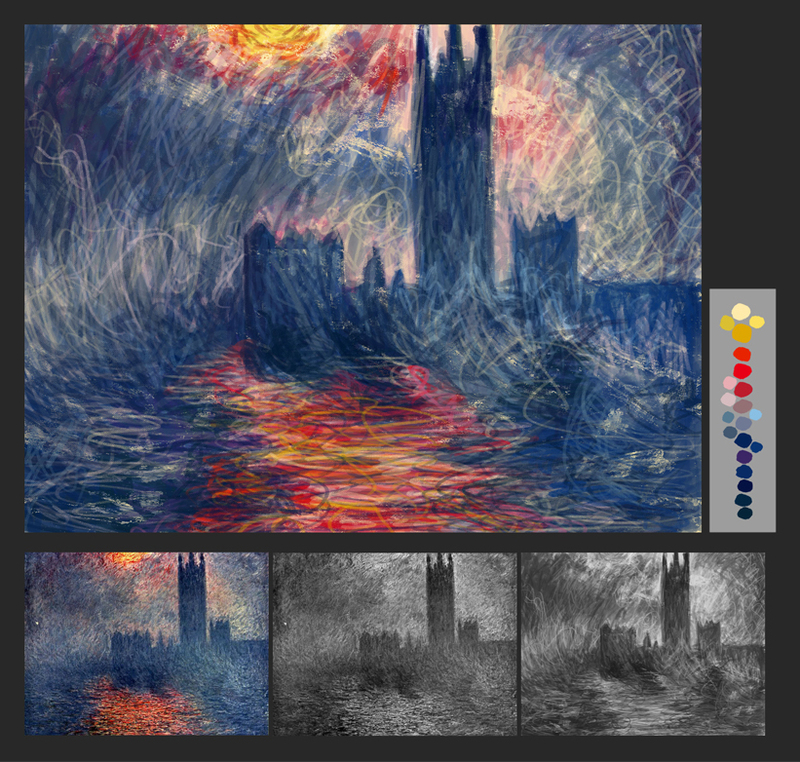 - next time with impressionism: paint at 100% opacity to avoid blending. - maybe muddiness can be avoided by applying pure colours. - an initial tonal value study is useful. - to concentrate in colour relationships, work with stains or bigger brushes. - try to simplify the image into zones. - identify the colours that are dominant, subdominant, subordinates and accents. - Monet was one of the greatest! - more details and textures in the foreground. - less volumes in the backgrounds. - colours change when placed next to each other. - do a sketch first! remember relationships to the picture-plane. - found the horse's tongue to be too bright, it's the first thing I see. - characters tend to be simpler, easier to read, cleaner. - a branch has many colours and saturations, the sun touches parts of it. - work with intention: if I'm analysing colours, then shapes or textures are secondary. 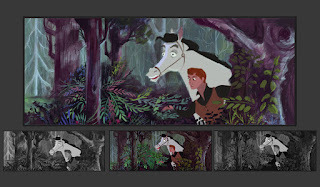 - Eyvind Earle's work is AMAZING!